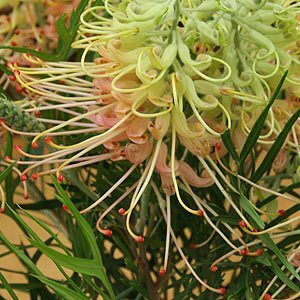 Growing to 1.5 – 2m (4-6ft) this is a long flowering grevillea with attractive large orange and pink flowers. Like all grevillea it is attractive to birds. Foliage is typical pale to mid green and this is a prolific flowering cultivar which adds to is popularity. A good compact growth habit especially in full sun. Can be used as a specimen plant or planted as a hedging or screening plant. Grevillea ‘Peaches and Cream’ prefers a sunny position and a well drained soil. In damp areas or clay type soils, build up the garden bed before planting to improve drainage. Reasonably frost tolerant and drought tolerant once established. Pruning is not generally required however tip pruning will keep the plan t in a bushier habit. Use a tree guard and stake when planting out to prevent damage from winds and animals until established. Fertilizer is not generally required in good soils, however a specialist Australian Native Plant fertilizer can be applied if required.